Call for Exhibitions The Multicultural Arts Center in Cambridge is now accepting proposals for gallery exhibitions. Work should be 2D, relating to the organization’s mission of supporting diversity and multicultural arts that help to educate the community about diversity. Learn more. Writers Fellowship Writing By Writers offers fellowships to the Esalen Writer’s Camp (Big Sur, CA) for emerging writers of color and members of the LGBTQIA+ community to amplify all voices that need to be heard. Fellowships cover the full cost of tuition, a shared room and all meals, but do not cover transportation. Learn more. Residency Program The MacDowell Colony in Peterborough, New Hampshire, provides time, space, and an inspiring environment to artists of exceptional talent. A MacDowell Fellowship consists of exclusive use of a studio, accommodations, and three prepared meals a day for two weeks to two months. There are no residency fees. Artists are responsible for materials and travel expenses: financial assistance is available to artists in residence based on need. MacDowell encourages applications from artists representing the widest possible range of perspectives and demographics. The sole criterion for acceptance is artistic excellence. Learn more. Of Note: The Arts Extension Service will offer an Artist-in-Business Training at UMass Springfield on April 27, 2019. In this day-long intensive, artists address key elements of both business and marketing practices to build their arts-based business. Learn more. Call for Exhibition Proposals for Solo and Small Group Shows ArtsWorcester invites proposals for solo and small group exhibitions to fill six openings in our 2019-2020 exhibition season and corporate art program. Proposals are evaluated first by a volunteer panel of regional art experts, then by an ad hoc committee of volunteers, artists, and board members familiar with our venues and operations. All proposals are viewed anonymously. Learn more. Call to Artists Limner Gallery in Hudson, NY, is accepting entries for their exhibition Meltdown. We are living in an age of global crisis – of catastrophic meltdown, a crisis the proportions of which, sadly, needs no description. Historically artists have foreseen, described and been inspired by crisis. The subject of this exhibition is every aspect of the meltdown crisis, be it global, personal, environmental, financial, psychological, scientific and/or spiritual. Entry is open to all artists working in any media. Learn more. Tactile Art TILL Wave Gallery in Watertown is accepting submissions for the exhibition Touch Me (May 16-July 5, 2019), calling for art that is meant to be touched: a tactile experience. Open to all artists, solo and collaborative, all media, 2- and 3-D. Artists may submit up to three works in JPEG format. Include name, address, phone number, title, price, media, and dimensions for each work along with artist statement to tillartwave@tillinc.org. Studio Improvement Grant Do you need to improve the ventilation system in your studio? Work with an attorney to plan your legacy? Improve health and safety in your artistic practice? CERF+ can help! Apply for a “Get Ready” Grant of up to $500 to help safeguard your studio, protect your career, and prepare for emergencies. Solarplate Printmakers Solar Impressions, a juried exhibition, will bring artists from all over the world to celebrate solarplate printmaking starting at the Southampton Arts Center in Southampton, NY and then traveling in the months to come. Learn more. Call for Artists & Scientists Oak Spring Garden Foundation is now accepting Letters of Intent to for a 2020 place-based project in the Virginia Piedmont that relates to the American chestnut tree. The Oak Spring Garden Foundation (OSGF) calls for arts and science collaborations to create a site-specific sculpture at the Oak Spring estate in the Virginia Piedmont. OSGF will fund up to $10,000 plus materials/supplies for this project. The awardee(s) will be provided two-weeks accommodation for up to four people at OSGF (on mutually agreed dates between April 15, 2020 – October 1, 2020). The completed work will become part of the OSGF permanent collection. Historic chestnut rails from OSGF must be utilized in the work produced. For questions or inquiries, please email programs@osgf.org. Craft Artist in Residence Program The Society of Arts and Crafts is excited to support an Artist in Residence Program, inaugurated in 2016. This program is designed to give craftspeople an opportunity to work in their studio and offers a unique experience to explore Boston’s diverse cultural and historical offerings. Learn more. 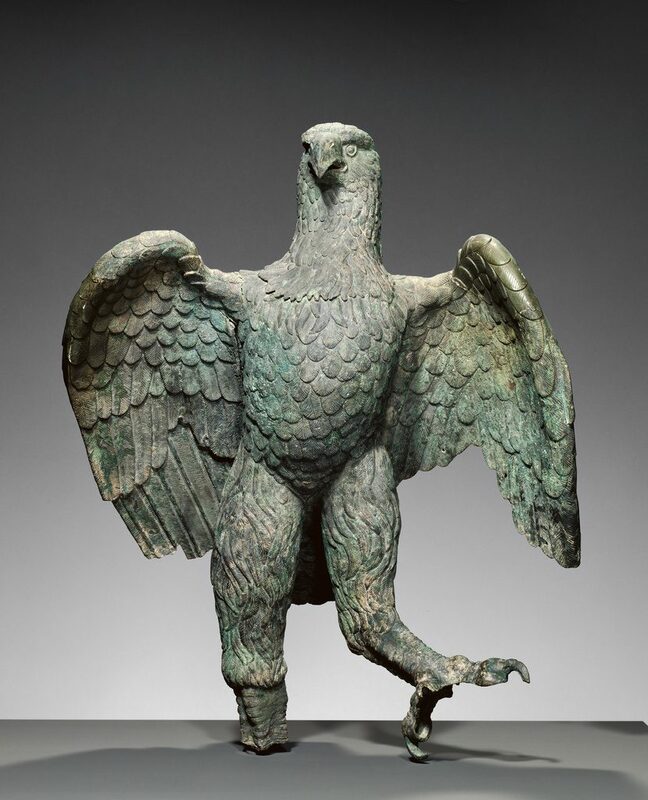 Image credit: Unknown, Eagle, Roman, A.D. 100–200, Bronze, 104.2 × 78.7 × 76.2 cm (41 × 31 × 30 in. ), 72.AB.151. From the collection of the J. Paul Getty Museum.